MAURICE, LA -- On the morning of April 18th a water protector locked herself into a cement filled barrel placed in the trench of a horizontal directional drill on a construction site of the Bayou Bridge Pipeline. 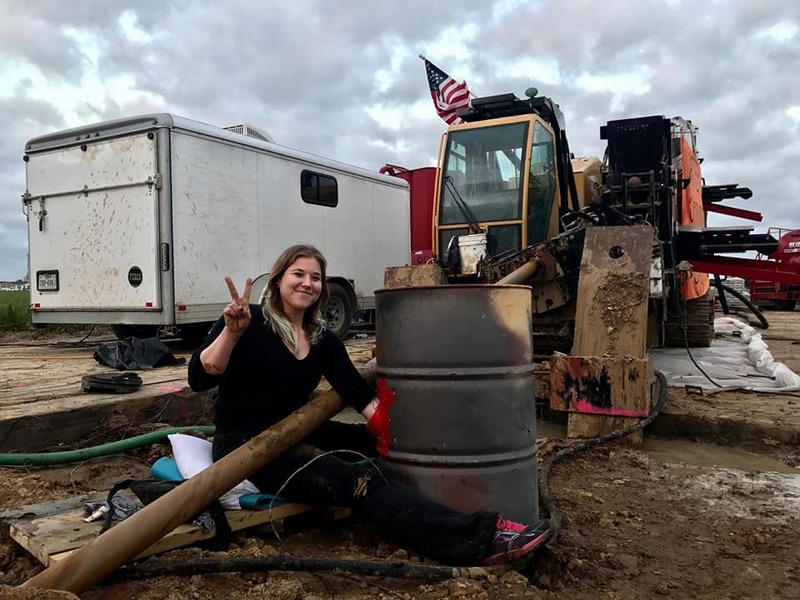 Over a dozen more water protectors from L'eau est La Vie resistance camp rallied alongside her blasting loud music and dancing under banners strung from the drill and excavators that stated "Water is Critical Infrastructure. Stop HB727" and "Stop ETP". The group was soon detained and ID'ed but were eventually let go and allowed to move to a public road nearby where they continued to shout words of support to their locked down comrade. Dozens of workers stood by in their cars and watched for hours while police worked on unlocking the water protector and getting the barrel out of the ground. 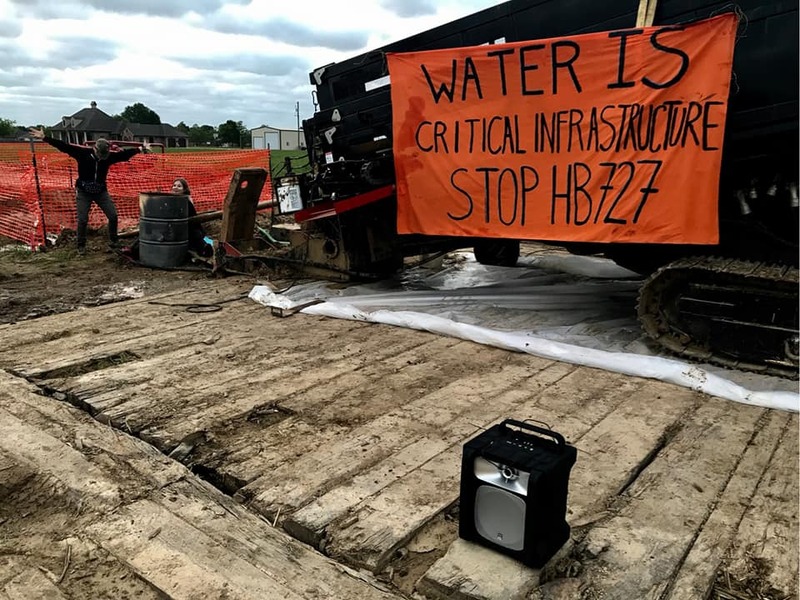 The group took action to draw attention to the 700+ waterways including the Atchafalaya Basin and much of Louisiana's only remaining natural crawfisheries that will will be impacted by the pipeline. The group also acted to address the frightening spill records and hazardous impact Energy Transfer Partners has had on small communities and the environment. According to the newest report (http://bit.ly/2IX9KGk), "From 2002 to the end of 2017, ETP, Sunoco and their subsidiaries and joint ventures reported 527 hazardous liquids pipeline incidents to federal regulators — approximately one incident from existing facilities every eleven days. Those incidents, reported by the Pipeline Hazardous Material Safety Administration (PHMSA), released a total of 87,273 barrels (3.6 million gallons, or about five-and-a-half Olympic-sized swimming pools) of hazardous liquids, including 66,515 barrels (2.8 million gallons) of crude oil." 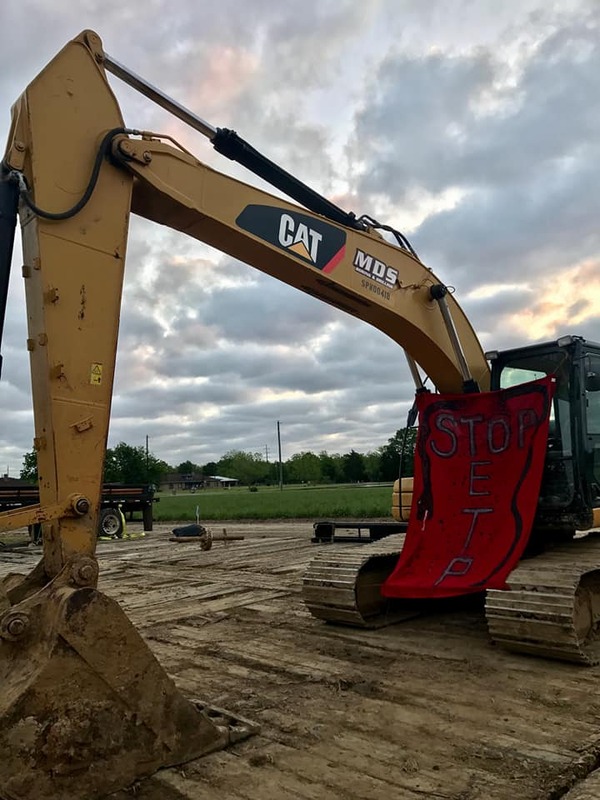 The locked down water protector stated, "ETP shouldn't be allowed to tear up our wetlands, especially when their record of spills consistent and spans over decades. People living in so-called Louisiana deserve better and it is time to put our bodies on the line. The HB727 bill is meant to scare us from protecting what is sacred. This is a peaceful protest against a violent company. We have to stop ETP."